In his effort to teach his disciples about what it meant to be great, Jesus uses a child as his object lesson. And he teaches them, "Whoever receives one such child in my name receives me, and whoever receives me, receives not me but him who sent me" (Mark 9:37). Perhaps when this task is the most humbling is when we talk to children, and get on their level, and realize that childhood isn’t so easy. That grown ups have been standing around and arguing about who is the greatest, and there are kids trapped in the middle (9:33-34). 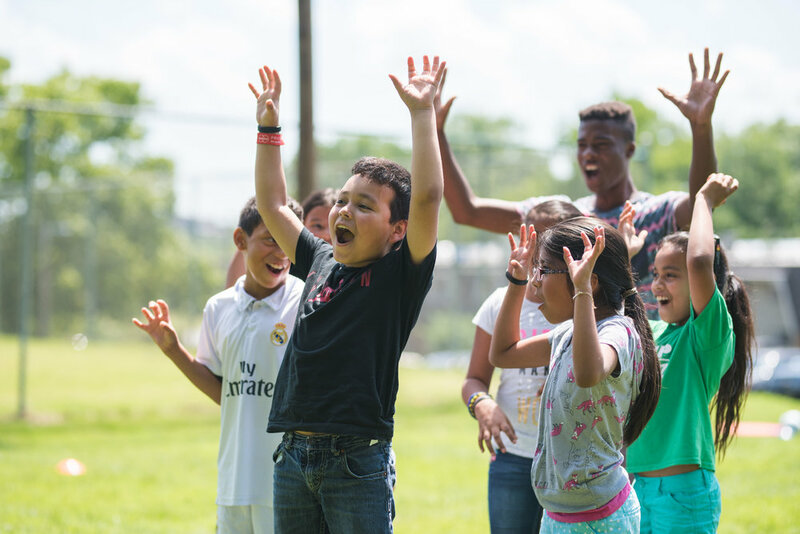 When we take youth groups to apartment complexes across Nashville, filled with immigrants and refugees, we introduce them to the kids caught in the middle. Last week, we hosted LIFT (a group from Michigan) and Mt. Sylvan UMC Youth (from Durham, NC). Together, they helped facilitate a week’s worth of activities to help kids be kids in the summer time. As we sat down for lunch with the kids one day, we heard them discuss the day’s concerns: whose parents would be the first to be deported. Receiving kids means listening to their considerations, and this was a hard one to stomach. Thinking about your parents being forcibly taken from your life, or together from your home, was a lunchtime topic. And it wasn't a question of "if," it was "when." Even more humbling is listening, and knowing there is very little you can do about the situation. But receiving the children, means receiving them as children--doing what is within your power to do: which for us, means letting them be kids, for at least a few hours a day. We love seeing kids come back year after year, knowing that they must have enjoyed their time with us! The water slide was an added surprise at the end of the week, paid for by one of the youth groups working the camp. Each week (and every week this summer), we let 100 immigrant and refugee kids be kids for part of a day. Youth groups from across the country are helping us to do so. Mt. Sylvan was so intent on doing good for these kids that they contributed extra funds to rent a water slide for the last day of camp. These groups understand Jesus’ lesson: that receiving children are receiving him, and receiving the one who sent him. Don’t be mistaken, this is no small or easy task. At one apartment complex, more than 17 languages are spoken. When summer is here, they’re out of school, without lunch, and without stimulation, while parents try their best to work and survive in a new world. One of the complex managers told us that the families consistently stop by the office, asking when camp will begin. When you see the gratitude in the faces of the moms, you know they're not asking because they're unsure how to handle them. They are genuinely happy that someone is receiving their children, when they themselves are often not received. Camp comes to them (literally, no transportation necessary) at no cost, making unprecedented use of camp clubhouses and tennis courts. And the kids are well received. This week, world-class magician Stephen Bargatze gave them a wonderful magic show. Their week was filled with painted signs with values they’re learning, enjoyed dance parties and board games when the rain came, and a huge inflatable water slide when the sun came back. Let the good work of these young people be a reminder to all of us, that kids are worth it. That far too often kids are forced to grow up too early, and that an effort to protect and maintain their position as a child is a worthy one. When we do it, we are receiving the one who sent Jesus himself, and that feels pretty great.